For other uses, see Brick Lane (disambiguation). Brick Lane street sign in English and Bengali. Brick Lane (Bengali: ব্রিক লেন) is a street in the East End of London, in the Borough of Tower Hamlets. It runs from Swanfield Street in Bethnal Green, crosses Bethnal Green Road in Shoreditch, enters Whitechapel and is linked to Whitechapel High Street to the south by the short stretch of Osborn Street. Today, it is the heart of the city's Bangladeshi community and is known to some as Banglatown. It is famous for its many curry houses. The Brick Lane Mosque, used first as a church and then a synagogue, reflecting changing demographics. Winding through fields, the street was formerly called Whitechapel Lane. It derives its current name from brick and tile manufacture started in the 15th century, which used the local brick earth deposits. and featured in the 16th century Woodcut map of London as a partially-developed crossroad leading north from the city's most easterly edge. By the 17th century, the street was being developed northwards from the Barres (now Whitechapel High Street) as a result of expanding population. Brewing came to Brick Lane before 1680, with water drawn from deep wells. One brewer was Joseph Truman, first recorded in 1683. His family, particularly Benjamin Truman, went on to establish the sizeable Black Eagle Brewery on Brick Lane. The Brick Lane Market first developed in the 17th century for fruit and vegetables sold outside the City. Successive waves of immigrants settled in the area: in the 17th century, French Huguenots expanded into the area for housing; the master weavers were based in Spitalfields. Starting with the Huguenots, the area became a centre for weaving, tailoring and the developing clothing industry. It continued to attract immigrants, who provided semi- and unskilled labour. In the 19th century, Irish people and Ashkenazi Jews immigrated to the area. Jewish immigration continued into the early 20th century. The Sunday market, like the ones on Petticoat Lane and nearby Columbia Road, dates from a dispensation given by the government to the Jewish community in the 19th century. At the time, there were no Sunday markets open because of the Christian observance of Sabbath. Located at the junction of Cheshire and Sclater streets, the market sells bric-a-brac as well as fruit, vegetables and many other items. In 2015 it was identified by police as the focal point of a trade in stolen bicycles and bicycle parts, many taken from City of London employees who had used "cycle to work" schemes. Alongside seven arrests, the police also warned purchasers that buying bicycles or parts in deals "too good to be true" could make them guilty of handling stolen goods. Near the junction with Hanbury Street are two indoor markets; Upmarket and Backyard Market. In 2010, the Brick Lane Farmers' Market opened, intended to be held every Sunday in nearby Bacon Street; it has now closed. In the later 20th century, Bangladeshis comprised the major group of immigrants and gradually predominated in the area. 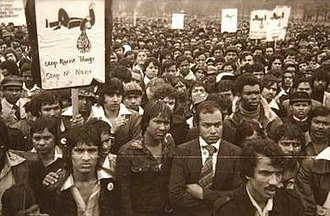 Many Bangladeshi immigrants to Brick Lane were from the Greater Sylhet region. These settlers helped shape Bangladeshi migration to Britain; many families from Jagannathpur and Bishwanath tend to live in the Brick Lane area. In 1742, La Neuve Eglise, a Huguenot chapel, was built on the corner of Brick Lane and Fournier Street. By 1809, it was used by missionaries as The Jews’ Chapel, where they promoted Christianity to the expanding Jewish population. It was adapted as a Methodist Chapel in 1819 for Protestant residents. (John Wesley had preached his first "covenant sermon" at the nearby Black Eagle Street Chapel). Reflecting the changing demographics of the area, in 1898, the building was consecrated as the Machzikei HaDath, or Spitalfields Great Synagogue. After decades of change in the area, with Jews moving out and Bangladeshis moving in, in 1976 it was adapted again as the London Jamme Masjid (Great London Mosque) to serve the expanding Bangladeshi community. The building is Grade II* listed. In the 20th century the Brick Lane area was important in the second wave of development of Anglo-Indian cuisine, as families from countries such as Bangladesh (mainly the Greater Sylhet region) migrated to London to look for work. Some curry houses of Brick Lane do not sell alcohol as most are owned by Muslims. Bengalis in the United Kingdom settled in big cities with industrial employment. In London, many Bengali people settled in the East End. For centuries the East End has been the first port of call for many immigrants working in the docks and shipping from Chittagong port in Bengal (British Empire in India was founded and based in Bengal). Their regular stopover paved the way for food/curry outlets to be opened up catering for an all-male workforce as family migration and settlement took place some decades later. Humble beginnings such as this gave birth to Brick Lane as the famous curry capital of the UK. Bengalis of Sylheti origin constitute only 10% of all South Asians in Britain; however around 90% of all South Asian restaurants in the UK are Sylheti- or Bengali-owned. More recently the area has also broadened to being a vibrant art and fashion student area, with considerable exhibition space. Each year most of the fine art and fashion courses exhibit their work near Brick Lane. Since the late 1990s, Brick Lane has been the site of several of the city's best known night clubs, notably 93 Feet East and The Vibe Bar, both built on the site of The Old Truman Brewery, once the industrial centre of the area, and now an office and entertainment complex. In 1999, it was the scene of a bombing that injured 13 people. Brick Lane has a regular display of graffiti, which features artists such as Banksy, Stik, ROA, D*Face, Ben Eine and Omar Hassan. The lane has been used in many music videos such as "Glory Days" by Just Jack, "All These Things That I've Done" by The Killers and "Überlin" by R.E.M.. The modern Old Montague Street was originally just Montague Street, preserving the maternal family name of George Osborn, 4th Baronet, whose mother, Mary Montague, was the daughter of George Montague, 2nd Earl of Halifax. The continuation of Chicksand Street to the East (now demolished) was once Halifax Street, referencing the same marriage. Modern Hanbury Street is made up of 4 streets shown on the 1853 map: Browns Lane, Montague Street (triggering the addition of 'Old' to the earlier street of the same name), Well Street and Church Street. An extract from Cross's New Plan Of London, showing Stepney and surrounding areas. Published 1853 by J.Cross of London. Nearby buildings of interest include Christ Church, Spitalfields, The Jamme Masjid or Great London Mosque on the corner of Fournier Street (the building represents a history of successive communities of immigrants in East End) and The Rag Factory on Heneage Street (once home to Turner Prize nominees Tracey Emin and Gary Hume, now a thriving arts space). The nearest London Underground stations are Aldgate East and Liverpool Street. In 2006 a campaign was launched to change the name of the Aldgate East station to "Brick Lane", but received no official support. The nearest London Overground station is Shoreditch High Street station. This line runs on part of the former East London Line which has now been converted to London Overground. At the junction with Pedley Street existed the former Shoreditch Underground station terminus, which closed in 2006 due to the construction of the East London Line extension, and replaced by the aforementioned Shoreditch High Street. Remnants of the station can be seen from trains entering and leaving Liverpool Street station. The street is the location for Monica Ali's book Brick Lane, published in 2003, and the film of 2007 starring Tannishtha Chatterjee. The novel provoked a controversy with some of the local South Asian community because of a perceived negative portrayal of them. Parts of the Bengali community were particularly opposed to plans by Ruby Films to film parts of the novel in the Brick Lane area and formed the "Campaign Against Monica Ali's Film Brick Lane." Consequently, the producers of the film used different locations for certain scenes, such as that depicting Brick Lane Market. Despite this, the director of the film, Sarah Gavron, attests on the DVD commentary of the film that genuine footage of Brick Lane does appear in the finished movie. Activists told The Guardian they intended to burn copies of Ali's book during a rally to be held on 30 July 2006, but the demonstration passed without incident. Other notable books on the area are Salaam Brick Lane by Tarquin Hall, On Brick Lane (2007) by Rachel Lichtenstein and An Acre of Barren Ground by Jeremy Gavron. A large collection of photographs of the characters and sales people who worked the markets in Brick Lane were taken by Fran May between 1976 and 1978, encouraged by Bill Brandt while Fran was a student of photography at the Royal College of Art. The street has been used for several filming locations for the BBC television show Luther (2013) in its third season. ^ "Bethnal Green: The West: Shoreditch Side, Spitalfields, and the Nichol", A History of the County of Middlesex: Volume 11: Stepney, Bethnal Green (1998), pp. 103-109 Retrieved 15 October 2007. ^ Robert Bard. Whitechapel & Stepney Through Time. Stroud: Amberley Publishing, 2014. Retrieved 30 January 2018. ^ The Black Eagle Brewery, Brick Lane, Survey of London: volume 27: Spitalfields and Mile End New Town (1957), pp. 116-122 Retrieved 15 October 2007. ^ Watts, Matt (18 May 2015). "Seven held at market as police target 'heart' of stolen bike trade". London Evening Standard. p. 18. ^ "London Farmers' Markets | Brick Lane Farmers' Market". ^ Michael Smith, John Eade (2008). Transnational Ties: Cities, Migrations, and Identities. Transaction Publishers. pp. 148-149. ^ Historic England. "Details from image database (205992)". Images of England. Retrieved 14 April 2009. ^ "Bringing Colour to the Block". Hookedblog — UK Street Art. Retrieved 2016-03-21. ^ a b Cokayne (compiler), G. E. (1904). The Complete Baronetage, Volume 3. Exeter, UK: William Pollard & Co Ltd. pp. 243–44. ^ "Bid to name Tube stop Brick Lane". BBC. 15 December 2006. Retrieved 10 January 2007. ^ Cacciottolo, Mario. 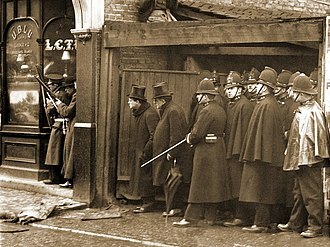 "Brick Lane protesters hurt over 'lies'", BBC News, 31 July 2006. ^ Myerson, Julie (1 April 2005). "Review: An Acre of Barren Ground by Jeremy Gavron". The Guardian. ^ "Fran May Gallery". Fran May Gallery. Wikimedia Commons has media related to Brick Lane. Brick Lane through the last two hundred years, including many genealogical pubs. Channel S is a UK-based, free-to-air television channel targeting the British Bangladeshi community. The channel was established on 16 December 2004, by Mahee Ferdous Jalill – a Bangladeshi businessman in London. On Sky it had a deal with ATN Global, and in 2005 it started to broadcast for 24 hours,7 days a week. The television station is based at Prestige House in Walthamstow, North East London and it broadcasts programmes in Bengali, Sylheti and a few in English. It is the first Bangladeshi channel to broadcast content in the Sylheti dialect, since the launch of the channel in 2004, there has been bitter rivalry between Channel S and Bangla TV, with Channel S gaining rights to broadcast the Baishakhi Mela. A survey in the UK found Channel S was the most viewed Bengali TV channel in the UK, on 16 December 2004, Channel S started to broadcast on Sky with a timesharing deal with ATN Global on channel 827. It was founded by a Bangladeshi businessmen based in London, Mahee Ferdous Jalil, in March 2005, it moved to its own EPG channel 837 and started broadcasting 24 hours a day,7 days a week, and moved to channel 814. These are available on Sky channels 826 and 827 respectively, on October 2008, it acquired the rights to broadcast a popular Bangladeshi channel called, Channel i on channel 826. In May 2007, Channel S launch Islam4U – a channel dedicated to Islamic programmes, Channel S provides viewers with a combination of cultural and religious programs for the viewers, including shows which help the community with legal or community issues. News is broadcast daily, with coverage of national news and international news, the main headline and political situation in Bangladesh. The channel has increasingly been providing programs in Sylheti, which is the first channel to do so and it recognises that Sylheti is a separate language than Bengali, targeting the majority Sylheti-speaking community. Lets Talk – hosted by Ajmal Masroor is a programme debating about current, as it claims to be the voice of the community, it provides people with advice concerning on legal issues, programs include Legal Advice and community-based issues such as Reality with Mahee. British Bangladeshis are people who have immigrated from Bangladesh to the United Kingdom. They have mainly settled in the boroughs of east London, primarily in the borough of Tower Hamlets, Haringey, Newham, over 50% of the Bangladeshi population living in the United Kingdom, live in London. The table below shows the dispersity of Bangladeshi people in the United Kingdom, the percentages include the population percentage of the total population of the region itself and the percentage of the Bangladeshi population in that region. The data for regional populations are estimates for 2006 from the Office for National Statistics, the Bangladeshi populations in the 17 local electoral districts called wards in London borough of Tower Hamlets. In comparison with all pupils nationally in the country, Bangladeshi pupils have average attainment at the end of key stage. The attainment of Bangladeshi pupils at Key Stage 1 is the considerably above the national average, the numbers of Bangladeshi pupils who are attaining five or more A*–C grades in the General Certificate of Secondary Education are above the national average. In London the pupils do better than the average of the whole city, at the end of Key Stage 2, they are attaining 11 percentage points, which is above the national average in English. 97 per cent of Bangladeshi students in Tower Hamlets mainly speak English as a language, after Sylheti. Bangladeshi pupils make more progress than several other minority ethnic groups between Key Stage 3 and GCSE, bengali speaking pupils with greater English fluency are closing the gap for GCSE average scores with other language groups. For example, 71% of Bangladeshi pupils who achieve level 5 at Key Stage 3 achieve five or more A*–C grades at GCSE, compared with 67% of Pakistani pupils and 48% of Black Caribbean pupils. Overall, the correlation between FSM eligibility and attainment at GCSE is less strong for Bangladeshi girls and boys than for other groups, a lot of Bangladeshis are mainly employed in the retail, transport and restaurant industries, for both men and women. This is unsurprising, because many Bangladeshis have founded the restaurant,1 in 3 Bangladeshi women worked in this industry in 2004, compared with one in five of all women in employment. Sylhet Division, known as Greater Sylhet or Sylhet region, is the northeastern division of Bangladesh, named after its main city, Sylhet. It is bordered by the Meghalaya and Tripura states of India to the north and south, Sylhet is considered one of the most picturesque and archaeologically rich regions in South Asia, and has major Islamic Sufi shrines and Hindu holy sites. Its bourgeoning economy has contributed to the attractions of landscapes filled with fragrant orange and pineapple gardens. Many Sylheti community members are working and residing abroad, particularly in the United Kingdom and they send remittances to fund projects and industries within the Sylhet Division, which have led to the expansion of the export industry and foreign investment sectors. Historians believe that Sylhet was an commercial centre since the ancient period. During this time, Sylhet was probably inhabited by Brahmins, though the population have included other contemporary South Asian ethnic groups as well as Arabs, Persians. It has suggested that the Ancient Kingdom of Harikela was situated in modern Sylhet. 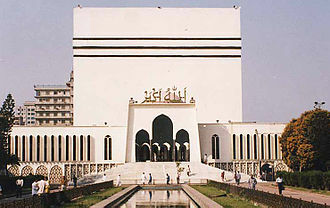 The 14th century marked the beginning of Islamic influence in Sylhet, during the medieval period, Sylhet was a leading centre of Persian-speaking Muslim missionaries. Sikander Ghazi was the nephew of Sultan Feroze Shah of Delhi, under the spiritual leadership of Hazrat Shah Jalal and his 360 companions, the Muslims converted many local Hindus. 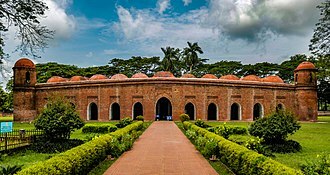 He died in Sylhet in or around the year 1350 CE and his shrine is located inside the parameter of the mosque complex known as Dargah-e-Shah Jalal. Shah Jalal remains revered, visitors arrive from all over Bangladesh, saint Shah Jalal and his companions are credited with converting most of the populace from their earlier beliefs in Hinduism and other religions to Islam. By the 15th century, Sylhet became a centre of the Assam, in the official documents and historical papers, Sylhet was often referred to as Jalalabad during the era of the Muslim rule. Sylhet is an important center of historical significance to Hindus, Sylhet is home to two of the fifty-one body parts of Sati, a form of Goddess Durga, that fell on Earth according to accepted legends. Methodism, or the Methodist movement, is a group of historically related denominations of Protestant Christianity which derive their inspiration from the life and teachings of John Wesley. George Whitefield and Johns brother Charles Wesley were significant leaders in the movement and it originated as a revival within the 18th century Church of England and became a separate Church after Wesleys death. Because of vigorous missionary work, the movement spread throughout the British Empire, Wesleys theology focused on sanctification and the effect of faith on the character of a Christian. Distinguishing Methodist doctrines include an assurance of salvation, imparted righteousness, the possibility of perfection in love, the works of piety and the primacy of Scripture. Most Methodists teach that Jesus Christ, the Son of God, died for all of humanity and that salvation is available for all, in theology and this teaching rejects the Calvinist position that God has pre-ordained the salvation of a select group of people. However and several others were considered Calvinistic Methodists and held to the latter position, Methodism emphasises charity and support for the sick, the poor and the afflicted through the works of mercy. These ideals are put into practice by the establishment of hospitals, soup kitchens and schools to follow Christs command to spread the gospel, the movement has a wide variety of forms of worship, ranging from high church to low church in liturgical usage. 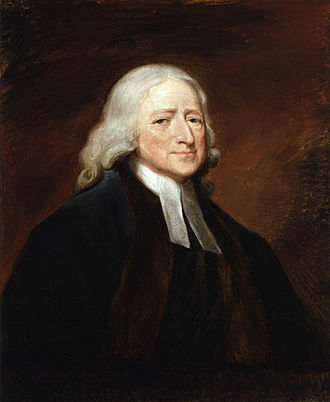 Denominations that descend from the British Methodist tradition are generally less ritualistic, Methodism is known for its rich musical tradition and Charles Wesley was instrumental in writing much of the hymnody of the Methodist Church. In Britain, the Methodist Church had an effect in the early decades of the making of the working class. In the United States, it became the religion of many slaves who formed black churches in the Methodist tradition. 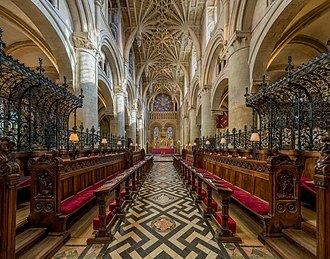 The Methodist revival began with a group of men, including John Wesley and his younger brother Charles, the Wesley brothers founded the Holy Club at the University of Oxford, where John was a fellow and a lecturer at Lincoln College. The club met weekly and they set about living a holy life. 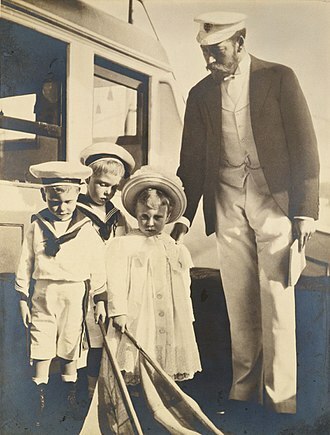 They were accustomed to receiving Communion every week, fasting regularly, abstaining from most forms of amusement and luxury and frequently visited the sick, the fellowship were branded as Methodist by their fellow students because of the way they used rule and method to go about their religious affairs. John, who was leader of the club, took the attempted mockery, unsuccessful in their work, the brothers returned to England conscious of their lack of genuine Christian faith. 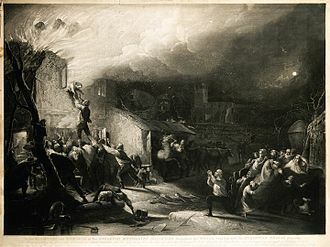 They looked for help to Peter Boehler and other members of the Moravian Church, at a Moravian service in Aldersgate on 24 May 1738, John experienced what has come to be called his evangelical conversion, when he felt his heart strangely warmed. Charles had reported an experience an few days previously. Considered a pivotal moment, Daniel L. John Wesley came under the influence of the Dutch theologian Jacobus Arminius, Arminius had rejected the Calvinist teaching that God had pre-ordained an elect number of people to eternal bliss while others perished eternally. Christianity is a Abrahamic monotheistic religion based on the life and teachings of Jesus Christ, who serves as the focal point for the religion. It is the worlds largest religion, with over 2.4 billion followers, or 33% of the global population, Christians believe that Jesus is the Son of God and the savior of humanity whose coming as the Messiah was prophesied in the Old Testament. Christian theology is summarized in creeds such as the Apostles Creed and his incarnation, earthly ministry and resurrection are often referred to as the gospel, meaning good news. The term gospel refers to accounts of Jesuss life and teaching, four of which—Matthew, Luke. Christianity is an Abrahamic religion that began as a Second Temple Judaic sect in the mid-1st century, following the Age of Discovery, Christianity spread to the Americas, sub-Saharan Africa, and the rest of the world through missionary work and colonization. 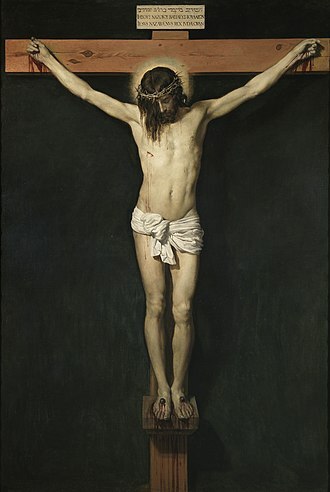 Christianity has played a prominent role in the shaping of Western civilization, throughout its history, Christianity has weathered schisms and theological disputes that have resulted in many distinct churches and denominations. 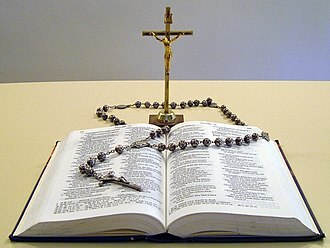 Worldwide, the three largest branches of Christianity are the Catholic Church, the Eastern Orthodox Church, and the denominations of Protestantism. There are many important differences of interpretation and opinion of the Bible, concise doctrinal statements or confessions of religious beliefs are known as creeds. They began as baptismal formulae and were expanded during the Christological controversies of the 4th and 5th centuries to become statements of faith. Many evangelical Protestants reject creeds as definitive statements of faith, even agreeing with some or all of the substance of the creeds. The Baptists have been non-creedal in that they have not sought to establish binding authoritative confessions of faith on one another. Also rejecting creeds are groups with roots in the Restoration Movement, such as the Christian Church, the Evangelical Christian Church in Canada, the Apostles Creed is the most widely accepted statement of the articles of Christian faith. It is used by Presbyterians and Congregationalists and this particular creed was developed between the 2nd and 9th centuries. 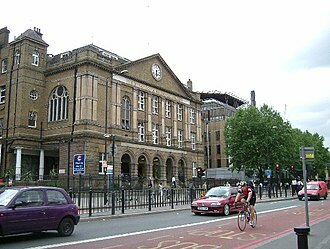 Bethnal Green is a district mostly in the London Borough of Tower Hamlets and partly in the London Borough of Hackney. Located 3.3 miles northeast of Charing Cross, it was historically a hamlet in the ancient parish of Stepney, the parish became the Metropolitan Borough of Bethnal Green in 1900 and the population peaked in 1901, entering a period of steady decline which lasted until 1981. Some 173 people were killed at an incident at Bethnal Green tube station in 1943. Bethnal Green has formed part of Greater London since 1965, the place-name Blithehale or Blythenhale, the earliest form of Bethnal Green, is derived from the Anglo-Saxon healh and blithe, or from a personal name Blitha. Nearby Cambridge Heath, is unconnected with Cambridge and may derive from an Anglo-Saxon personal name. The area was marshland and forest which, as Bishopswood. 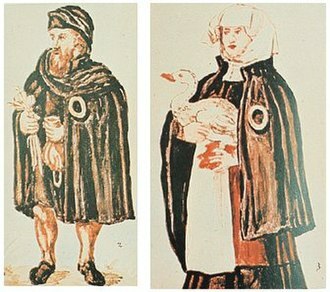 Over time, the name became Bethan Hall Green, which, a Tudor ballad, the Blind Beggar of Bethnal Green, tells the story of an ostensibly poor man who gave a surprisingly generous dowry for his daughters wedding. The tale furnishes the parish of Bethnal Greens coat of arms, the Blind Beggar public house in Whitechapel is reputed to be the site of his begging. Boxing has an association with Bethnal Green. Daniel Mendoza, who was champion of England from 1792 to 1795 though born in Aldgate, since numerous boxers have been associated with the area, and the local leisure centre, York Hall, remains notable for presentation of boxing bouts. He was a capable pastoral visitor and established a parochial school, after examining the text of the sermon, the Bishop of London condemned it as containing erroneous and dangerous notions. As a result, the bishop sent Woodard to be a curate in Clapton, the Green and Poors Land is the area of open land now occupied by Bethnal Green Library, the V&A Museum of Childhood and St Johns Church, designed by John Soane. In Stows Survey of London the hamlet was called Blethenal Green and it was one of the hamlets included in the Manor of Stepney and Hackney. From that date, the trust has administered the land and its books are kept in the London Metropolitan Archives. The Irish people are a nation and ethnic group native to the island of Ireland, who share a common Irish ancestry and culture. Ireland has been inhabited for about 9,000 years according to archaeological studies, for most of Irelands recorded history, the Irish have been primarily a Gaelic people. Today, Ireland is made up of the Republic of Ireland, the people of Northern Ireland hold various national identities, including Irish, Northern Irish, British, or some combination thereof. The Irish have their own customs, music, sports, although Irish was their main language in the past, today the huge majority of Irish people speak English as their first language. Historically, the Irish nation was made up of kin groups or clans, there have been many notable Irish people throughout history. After Irelands conversion to Christianity, Irish missionaries and scholars exerted great influence on Western Europe, the 6th-century Irish monk and missionary Columbanus is regarded as one of the fathers of Europe, followed by saints Cillian and Fergal. The scientist Robert Boyle is considered the father of chemistry, famous Irish writers include Oscar Wilde, W. B. Yeats, George Bernard Shaw, Bram Stoker and James Joyce, notable Irish explorers include Brendan the Navigator, Robert McClure, Ernest Shackleton and Tom Crean. By some accounts, the first European child born in North America had Irish descent on both sides, many presidents of the United States have had some Irish ancestry. The population of Ireland is about 6.3 million, but it is estimated that 50 to 80 million people around the world have Irish forebears, emigration from Ireland has been the result of conflict and economic issues. People of Irish descent are mainly in English-speaking countries, especially the United Kingdom. There are significant numbers in Argentina and New Zealand, the United States has the most people of Irish descent, while in Australia those of Irish descent are a higher percentage of the population than in any other country. Many Icelanders have Irish and Scottish Gaelic forebears, in its summary of their article Who were the Celts. The East End of London, known simply as the East End, is an area of Central and East London, east of the Roman and medieval walls of the City of London, and north of the River Thames. The relevance of Strypes reference to the Tower was more than geographical, the East End was the major part of an area called the Tower Division, which owed military service to the Tower of London. Later, as the East End grew and the Tower Division contracted, the area was notorious for its deep poverty and associated social problems. 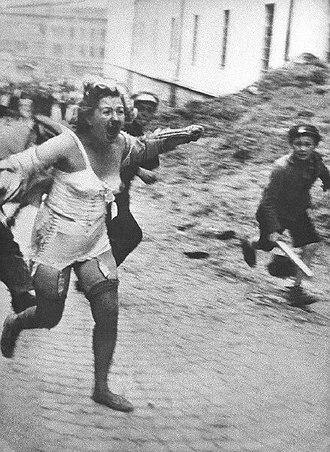 This has led to the East End’s history of political activism. Another major theme of East End history has been that of migration, Irish weavers, Ashkenazi Jews and, in the 20th century, Bangladeshis. The East End lies east of the Roman and medieval walls of the City of London, Aldgate Pump on the edge of the City is the symbolic start of the East End and, on the river, Tower Bridge is sometimes described in these terms. Beyond these references though, the East End has no official or popularly accepted boundaries, a common preference is to include the modern borough of Tower Hamlets, together with the former parish and borough of Shoreditch. This version makes the East End conterminous with the Tower Division of Middlesex under the borders that area had in the 19th century when the East End completed the process of urbanisation, an alternative definition is based solely on the modern borough of Tower Hamlets. Parts of the old parish and borough of Hackney are sometimes included, while others include areas east of the Lea such as West Ham, East Ham, knew not the way to the East End. The East End began with the growth of London beyond the walls, along the Roman Roads leading from Bishopsgate and Aldgate. Building accelerated in the 16th century, and the area that would become known East End began to take shape. The relevance of Strypes reference to the Tower was more than geographical, the East End was the major part of an area called the Tower Division, which had its roots in the Bishop of Londons historic Manor of Stepney and owed military service to the Tower of London. Later, as the East End grew and the Tower Division contracted, for a very long time the East End was physically separated from the Londons western growth by the open spaces known as Moorfields. The Culture of Bangladesh refers to the way of life of the people of Bangladesh. It has evolved over the centuries and encompasses the cultural diversity of social groups of Bangladesh. The Bengal Renaissance contained the seeds of a nascent political Indian nationalism and was the precursor in many ways to modern Indian artistic, the culture of Bangladesh is composite and over the centuries has assimilated influences of Islam, Hinduism and Christianity. The music and dance styles of Bangladesh may be divided into three categories, classical and modern. Several dancing styles in vogue in the part of the Indian subcontinent, like Manipuri and Santhali dances, are practised. Bangladesh has a tradition of folk songs, with lyrics rooted in vibrant tradition and spirituality, mysticism. Such folk songs revolve around themes, including love. The most prevalent folk songs and music traditions include Bhatiali, Marfati, lyricists like Lalon Shah, Hason Raja, Kangal Harinath, Romesh Shill, Abbas Uddin, and many unknown anonymous lyricists have enriched the tradition of folk songs of Bangladesh. In a relatively modern context, Robindro Shongit and Nazrul Giti form precious cultural heritage of Bangladesh, western influences have given rise to quality rock bands, particularly in urban centres like Dhaka. Currently, musical instruments of western origin like guitars, the Bangladeshi press is diverse and privately owned. Over 200 newspapers are published in the country, Bangladesh Betar is the state-run radio service. The British Broadcasting Corporation operates the popular BBC Bangla news and current affairs service, Bengali broadcasts from Voice of America are very popular. Bangladesh Television is the television network. There more than 20 privately owned television networks, including several news channels, freedom of the media remains a major concern, due to government attempts at censorship and harassment of journalists. The cinema of Bangladesh dates back to 1898, when films began screening at the Crown Theatre in Dacca, the first bioscope in the subcontinent was established in Dacca that year. The London Borough of Tower Hamlets is a London borough to the east of the City of London and north of the River Thames. It is in the part of London and covers much of the traditional East End. It includes much of the redeveloped Docklands region of London, including West India Docks, many of the tallest buildings in London occupy the centre of the Isle of Dogs in the south of the borough. A part of the Queen Elizabeth Olympic Park is in Tower Hamlets, the borough has a population of 272,890, which includes one of the highest ethnic minority populations in the country and has an established British Bangladeshi business and residential community. Brick Lanes restaurants, neighbouring street market and shops provide the largest range of Bengali cuisine, carpets, the local authority is Tower Hamlets London Borough Council. The council, as of 2017 comprises 23 Labour Councillors,5 Conservative councillors,18 independent councillors of various affiliation, Tower Hamlets is located to east of the City of London and north of the River Thames in East London. The London Borough of Hackney lies to the north of the borough while the River Lea forms the boundary with the London Borough of Newham in the east. On the other side of the Thames is The London Borough of Southwark to the southwest, The London Borough of Lewisham to the South, the River Lea forms the boundary between those parts of London historically in Middlesex, with those formerly in Essex. The Regents Canal enters the borough from Hackney to meet the River Thames at Limehouse Basin, a stretch of the Hertford Union Canal leads from the Regents canal, at a basin in the north of Mile End to join the River Lea at Old Ford. A further canal, Limehouse Cut, Londons oldest, leads from locks at Bromley-by-Bow to Limehouse Basin, most of the canal tow-paths are open to both pedestrians and cyclists. Victoria Park was formed by Act of Parliament, and administered by the LCC, since the latter authoritys abolition, the park has been administered by Tower Hamlets. Part of the borough is within the boundary of the Thames Gateway development area, the Hamlets of the Tower paid taxes for the militia in 1646. Whitechapel Road is a major arterial road in Whitechapel, Tower Hamlets, in the East End of London. 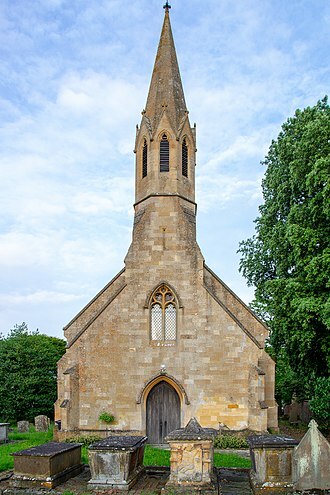 It is named after a chapel of ease dedicated to St Mary. The road is part of the historic Roman Road from London to Colchester, the road had become built up by the 19th century and is now a main shopping district in the Whitechapel area. There is a street market along the road next to Whitechapel tube station. The Whitechapel Bell Foundry and the Royal London Hospital have been based on Whitechapel Road since the 18th century and it remains an important road and is marked with bus lanes, with limited parking. Several ethnic minority communities have centred on Whitechapel Road, the road was a focal point of the Jewish Community from the 1850s to the 1930s, with many Jewish shops and market stalls. Altab Ali Park sits on the site of the church at the western end of Whitechapel Road. The roads name, along with the area, is derived from the original 14th-century White Chapel and it follows the section of the Roman road between Londinium and Camulodunum, which connected to the Pye Road to Venta Icenorum. The section of the Roman Road that is now Whitechapel Road is a Primary A-road, the A11, owing to the popularity of the market, parking is heavily restricted, limited to occasional parking metered spaces along the road. Cycle Superhighway CS2 runs along Whitechapel Road, the nearest London Underground stations are Whitechapel station and Aldgate East station and the nearest National Rail station is Bethnal Green railway station. A number of local London Buses routes run along Whitechapel Road, the road has been an important thoroughfare and coaching route for centuries. Whitechapel High Street and Whitechapel Road are named as such on John Rocques Map of London,1746, on John Carys Environs of London of 1795 there are properties on both sides of the road. By the ninth edition in 1821, the road is shown as extensively built up, in the mid-19th century, drovers steered livestock from local farms along the road towards Smithfield Market, causing considerable traffic congestion. By the 1870s, the road had become extensively developed with properties along the stretch of the road. 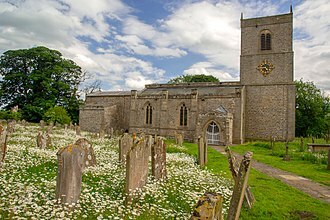 A listed building or listed structure, in the United Kingdom, is one that has been placed on the Statutory List of Buildings of Special Architectural or Historic Interest. The statutory bodies maintaining the list are Historic England in England, Cadw in Wales, Historic Scotland in Scotland, the preferred term in Ireland is protected structure. In England and Wales, an amenity society must be notified of any work to a listed building which involves any element of demolition. Owners of listed buildings are, in circumstances, compelled to repair and maintain them. When alterations are permitted, or when listed buildings are repaired or maintained, slightly different systems operate in each area of the United Kingdom, though the basic principles of the listing remain the same. It was the damage to caused by German bombing during World War II that prompted the first listing of buildings that were deemed to be of particular architectural merit. The listings were used as a means of determining whether a building should be rebuilt if it was damaged by bombing. Listing was first introduced into Northern Ireland under the Planning Order 1972, the listing process has since developed slightly differently in each part of the UK. In the UK, the process of protecting the historic environment is called ‘designation’. A heritage asset is a part of the environment that is valued because of its historic. Only some of these are judged to be important enough to have legal protection through designation. However, buildings that are not formally listed but still judged as being of heritage interest are still regarded as being a consideration in the planning process. Almost anything can be listed – it does not have to be a building and structures of special historic interest come in a wide variety of forms and types, ranging from telephone boxes and road signs, to castles. Historic England has created twenty broad categories of structures, and published selection guides for each one to aid with assessing buildings and these include historical overviews and describe the special considerations for listing each category. An Asian business leader showcasing his awards at the Grange Hotel in London. 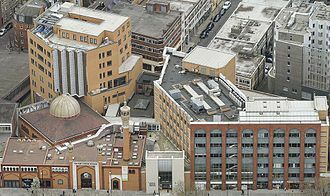 Aerial view: on the left is the mosque with dome and minaret, to the right is the London Muslim Centre, with the Maryam Centre rising behind the mosque. A mancus / gold dinar of king Offa, copied from the dinars of the Abbasid Caliphate (774); it includes the Arabic text Muhammad is the Apostle of Allah, a line from the Shahada. 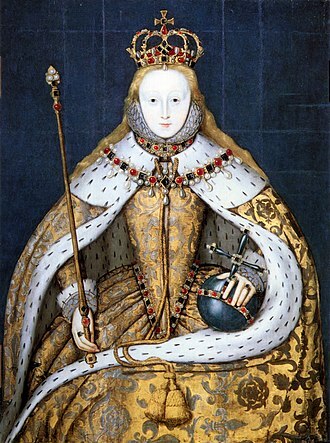 Elizabeth I of England was one of the earliest British monarchs to establish relations, alliances and trade with Muslim majority countries. Sadiq Khan, a British Pakistani and the first Muslim elected as Mayor of London. London Wall, the Tower of London and Tower Bridge, inner boundaries of the East End. Immediately to the east (left) lie St Katharine Docks and 6½ miles of former Docklands. Brick arch and globe sculpture on Roman Road, Bethnal Green, Globe Town is directly to the right of photo. 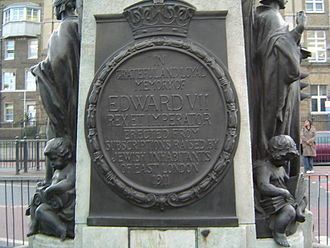 Plaque remembering King Edward VII. 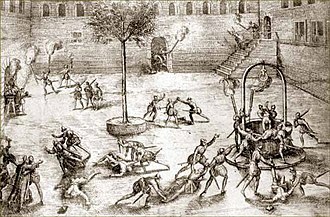 Huguenots massacring Catholics in the Michelade in Nîmes. Millais' painting, Huguenot Lovers on St. Bartholomew's Day. 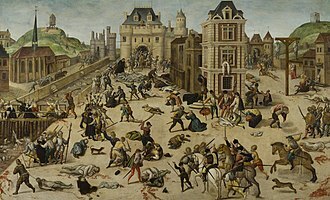 The St. Bartholomew's Day massacre of French Protestants (1572). It was the climax of the French Wars of Religion, which were brought to an end by the Edict of Nantes (1598). 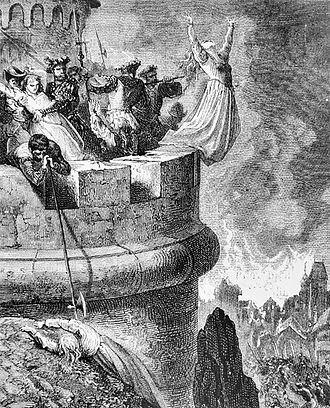 In 1620, persecution was renewed and continued until the French Revolution in 1789. Ireland's Holocaust mural on the Ballymurphy Road, Belfast. "An Gorta Mór, Britain's genocide by starvation, Ireland's holocaust 1845–1849, over 1,500,000 deaths". Madhabpur lake of the division's Moulvibazar district. Looking east on Whitechapel Road, near Whitechapel tube station. The street market is on the left. St. Mary's (Whitechapel Road) tube station on Whitechapel Road, shortly after closure in 1938. The building was destroyed in 1940. Typical Bangladeshi occupied housing estates, where many live in two bedroom flats.